The secret to my chili is something I call “Chief’s Chili Mix”. It sits in a big mason jar at the back of my spice cabinet and contains….. Well. I could tell you but my mom didn’t raise a dummy. My jar of secret ingredients has evolved over the years as I fine tune the recipe based on the evolution of my own personal taste and the suggestions of friends. The recipe has gone from being dry and not so spicy to more of a stew-like consistency with a kick. Recently, I got a flyer dropped on my desk informing me of a cook-off in Seward County and for the first time in my life I thought that it would be fun to participate in such an event. The Seward County United Way Chili, Soups & Sweets Cookoff will be on September 19th at Blue Bonnet Park starting at 11:30am. It looks to be challenging as I have never made a batch for a competition and never a batch of 3 gallons. With the challenge comes the desire to step up my game and luckily we have quite a few new cookbooks here at the library that I hope will help me bring home a trophy. 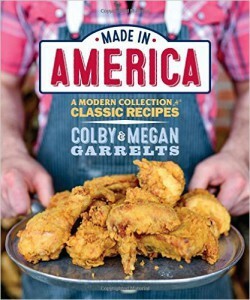 In the few short months that this cookbook has come out, it has proven to be one of my all time favorites. Full of rustic, down home recipes, the flavors introduced in this book are always spot-on and remind one of meals your grandfather would have cooked on the summer grill. 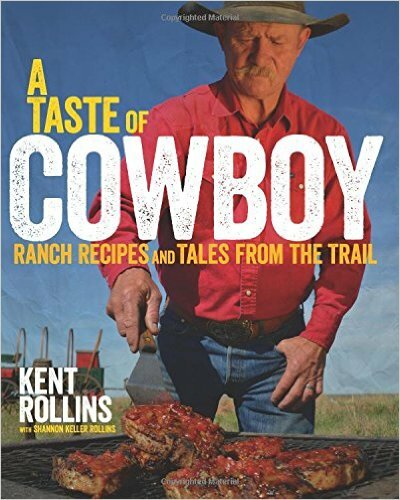 Make sure you have some cast iron cookware on hand as Kent Rollins is big on taking cooking back to the tried and true days of the chuckwagon. 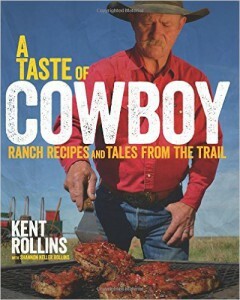 Now we know why the cowboys faded away, too much of this food and you are not getting back on a horse anytime soon. 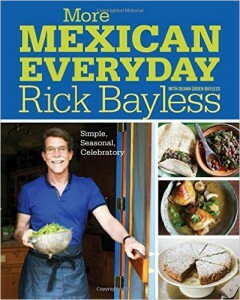 For many of us our palate was forever changed when Rick Bayless released Mexican Kitchen in 1996. Rick brings the flavors of Mexico to life for those new to cooking with the wonderful ingredients native to Mexico and replete with the cooking methods needed to bring those ingredients to life. You never go with a recipe from his cookbook. My personal favorite is his recipe for Mustard Greens Soup with Poblanos and Almonds. Yummm! This is the cookbook that I think everyone should have on their shelf. My cooking bible is Fannie Farmer, but this is now in the number two spot. If you want to cook the food that makes you feel at home, in your back yard, with the kids running around, then this is the cook book for you. From cover to cover this cookbook is full of wonderful recipes for ribs, pork chops, fried chicken and apple pie. These are the cookbooks that are currently influencing my cooking and will hopefully see me on the victor’s platform at the United Way Chili, Soups & Sweets Cookoff. For more information on the event please see the entry form at www.scunitedway.com or call 620.624.5400. There is a $25 entry free, but all proceeds go to the Seward County United Way 2016 Campaign and goes to support the work and services they provide to our community. This week is a little bittersweet at the library. As kids go back to school, a calm now settles over the library during the day. We will of course miss the kids, but we are also excited to get extra time during the day to plan new activities, programs, and get the library back together after a busy summer. 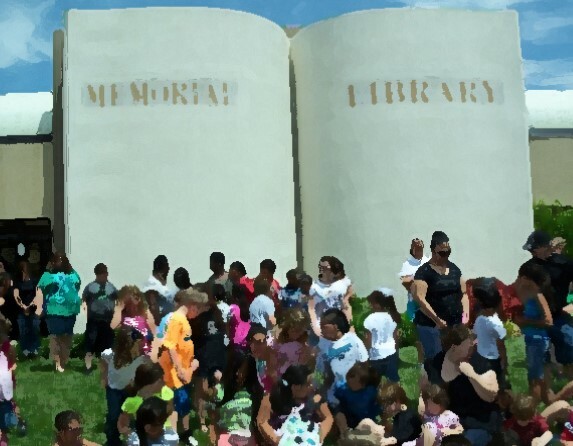 We learned quite a bit over the summer about what activities get the kids and adults excited about the library and those activities that just fell flat. With that knowledge in hand we have some good ideas on how to enhance current programming offered to children and young adults and what new programming will hopefully hit the mark. We are excited to get these rolled out during these first few weeks of the school year. 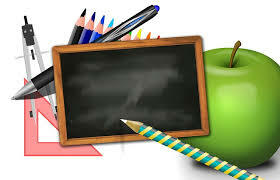 Starting August 31st at the Library is our Afterschool Program from 4pm-6pm, Monday through Thursday. Last year when we did the Afterschool Program we had different activities for each day. We will continue with this idea, but will broaden our scope to include more activities and crafts and to also include things for the kids to do that are independent of that day’s plan. Hopefully this will allow us to provide something that will be exciting for every kid that walks through our door. Different this year than last is that we will switch from calling it the Afterschool Program and start calling it the Afterschool Club. (Yes. The first thing we need to do in Afterschool Club is come up with a new name.) We are going to a sign up process for the club that will allow kids to gain points from Club related activities. Kids who join the club (which is free) will also get points for reading, community activities, and other library related programs. At the end of each month, the kids who have gained a certain amount of points will get to partake in a special party just for them. We are making the list of ways to get points pretty extensive, so my hope is that all kids will find they qualify for the party. If you know of any kids that want to join: call, email, or stop by the library for more information. Now for you adults that may start to feel left out at this point, don’t worry. We have something for you as well. During the Adult Summer Reading Program we tried out a variety of activities to see which ones would get the most traction with our adult patrons. Sadly, trivia wasn’t a favorite. But we did learn that adults appreciate the opportunity to interact with area professionals about topics that relate to health and wellness. With that in mind we will be rolling out in September a once a month program where we will touch upon a topic related to health and wellness. Another thing that we learned about our adult users this summer is their interest in local history. With that in mind we will also focus on making those materials easier to find for our patrons and work on bringing in local and area speakers to talk about historical topics relating to Liberal, Seward County, and Southwest Kansas. Recently we were contacted by author Stew Magnuson who wrote the book “The Last American Highway: A Journey through time down U.S. Route 83: Nebraska Kansas Oklahoma.” He will be at the library on Wednesday, September 23rd at 6:30 pm for an hour long program that uncovers stories found along the road that bisects the United States from North to South. These are just a few of the things we have on the agenda for the library this fall. See you at your library. I love libraries. Considering that I am the Library Director here in town this is a good thing. I had the pleasure a few years ago to give a presentation to graduate students in library school about why I thought libraries are important to society. Instead of going over all the research and professional writing done on the topic, I made my discussion a personal one. I remember quite well my days as a young boy visiting the library during the summers. I grew up in the town of Springfield, Missouri and we had a main branch and a half dozen smaller branches throughout the city. I had the pleasure of using the Main Branch. In my presentation to the library school students I started off with a picture of the front steps of that library. The next slide was of the first house I remember living in. The next slide was of the library. The next slide was of the second house I remember living in. About 10 slides later and you see the 12 houses where my family lived as I was growing up. In between each of those pictures was a picture of that Main Branch. To say that the library was a stabilizing force throughout the constant moving during my youth is an understatement. I remember quite well the librarian I met after school each day and during the summers. I feel bad that I never asked her name and only ever referred to her as “Ms. 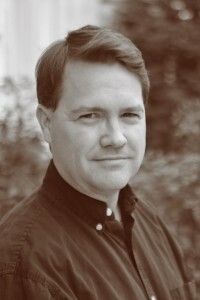 Librarian”. Given that I was part of a rather large family in the area known as The Rideeouttes, it was to be expected that I was a little hellion, and I lived up to those expectations. It was not uncommon for an authority figure to say “Are you one of those Rideeoutte kids?” Given my predilection for loud talking, running, and constantly making noise, I was usually not in the library for very long before I was asked by Ms. Librarian to leave the building. (By the way, if you don’t want kids to play swords with newspaper holders, you shouldn’t make them look like a sword.) She would always pull me aside as I left the building and said “I hope to see you tomorrow when you can behave.” This really never did happen, well the behaving part didn’t. I did go back every day, but somewhere along the way I developed a love for learning and reading. Once I figured out how to use a card catalog system I was in a world of my own. For those of you too young to know what I mean by a card catalog system, picture the Internet written on 3 by 5 cards and stuffed into a wooden box. Ms. Librarian is the librarian that has most influenced my professional career as a librarian. I strive to have her patience, but more importantly her never give up on any kid attitude. I am sure her life would had been easier if she had just told me to never come back, but she didn’t. The best way to get a kid to read a book is to talk to them about what sparks their interest and how they feel about the other books they have read. At the beginning of this summer I met a young lady named Bernice. Bernice visits the library pretty much every day. When I first met Bernice I asked her my typical question “When is the last time you read a book?” Her response was “I hate books.” As you could imagine, those words are like daggers to a librarian. Over the next couple of weeks I made sure to talk to Bernice every time I saw her in the library. Part of getting a kid to read is first being able to talk to them on their level. Once a child understands that you are listening, they will want to talk to you. Which is much better than the typical “Why is this adult talking to me” look kids give most adults. One day after a healthy eating event we had at the library this summer, I sat there at my desk with about two dozen oranges leftover from the program. At that moment, I had the epiphany to give every kid who checks out a book and reads a chapter an orange. Specifically those kids we get to know over the summer. After talking over my plan with the kids, the children’s library area was buzzing with activity as kids checked out books and tried to read a chapter as fast as possible. All for an orange. I even managed to talk Bernice into checking out a book. I will always remember the title “Baby Mouse”. By the way this is a great book for kids who say they hate reading. Baby Mouse is such an endearing character and gets into the funniest of dilemmas. After I had passed out all my oranges, I looked over and Bernice was way past reading that first chapter. What a sight to see! A kid reading in the library. I have to say that this is the best thing I heard all summer. One of the fun things about my first year of being director here at the Liberal Memorial Library is watching the rebirth of our Friends of the Liberal Memorial Library group. Established long ago, the group had dwindled in membership, and as with most groups you lose a couple of key people and it gets hard to keep things together. Friends groups are an excellent way for community members who want to volunteer or give back to the library to participate in the energy that the library generates. Friends are wonderful advocates for what is going on at the library and spreading the message about what the current library has to offer. As advocates they are essential. As I am oft to say, as employees we get paid to make sure the library is an awesome place, as trustees we are appointed to make sure the library is awesome place, but friends volunteer to make the library an awesome place. They give of their time and money to bring about enhancements and to fund special projects that are not always in our budget. In my first meeting with the Library Board it became a topic of discussion that we would like to see the Friends group up and going. So we set about the task of making it happen. Luckily even without a club being active, the previous director had kept the group’s tax status in place and the group still had an active savings account. Now just to find the people! We sent out invitations, printed up brochures, and began pounding the pavement looking for members. Within a few short months we had a small nucleus of people willing to put the time and effort into getting the group off the ground. A big thanks to Sheila Wells and Amy Thompson for their effort in this regards. With their help and enthusiasm our friends group is now up to about 50 members. With the Friends group in place it was decided that what we needed was a project that would help the community. The first project that the Friends of the Liberal Memorial Library has taken on is called “A Baby’s Bookshelf.” The idea behinds A Baby’s Bookshelf is that parents who have recently had a child can come into the library every two months for two years and pick up a free book for their child. At the end of the two years they would theoretically have 12 books. Studies show that having physical contact with books and reading materials greatly increase the chances that a child will learn to read at an early age. The books that we purchase through money generated by the activities of the Friends touch on the different aspects of pre-literacy skills that positively position children to learn how to read. The Friends group has two avenues of generating income to fund these special projects. The first is through membership dues. At $5.00 for individuals and $10.00 for families this is a pretty good deal. Just one individual membership in the Friends group helps to purchase two books for the baby’s bookshelf project. Our second big fund raiser is our Annual Book Sale in April. This takes place each year during National Library Week. The benefit of being a Friend during the book sale is you get to shop the night before everyone else. That is just a sampling of who the friends are, what we do, and the ways they enrich the community. If you are interested in being a Friend of the Liberal Memorial Library, please stop by the library and ask for Royce, or go online at our website www.lmlibrary.org and click on the Friends tab, or follow us on Facebook at: Friends of the Liberal Memorial Library. Whew! We did it! Or more importantly you did it. 2015 Summer Reading is officially in the books. The library hasn’t quite yet put all the numbers together, but it looks like we had another record breaking year in terms of program attendance and the number of finished reading logs turned in. I want to take a quick minute and say thank you to our staff that put together an awesome childrens and young adults line-up. We left no stone unturned in providing what was a great summer reading gauging by the smiles on the faces of our participants. Library staff did an awesome job of improvising on the spot and doing what needed to be done to make sure things went off as planned. A good example of this is when a performer failed to show up and our Assistant Director Tammy gave an impromptu program on dog training. This summer reading season also saw the library being a site for the Summer Food Program through the USDA and USD 480. Not only were we able to nourish kids minds but their stomachs as well. For the library it also meant a chance to reach more patrons and to tell people about library programs and services. The program continues through July 24th. An important thing to remember about the Summer Food Program is that the emphasis is on providing a child with a nutritious lunch. It is not dependent on income level or qualifying for any particular program. You come in, get a lunch, and eat up. That’s it. In a month of highlights it is hard to pick out just a few moments to talk about but there are a few that stand out. My personal favorite was the Southern Pioneer Power Van. Usually when you see someone working on a utility pole you understand how dangerous it is, but aren’t really aware of just how dangerous. 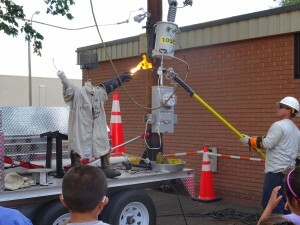 Watching the people from Southern Pioneer show us electrical arcing on a dummy drove the point home. If the crackling of the high voltage wasn’t enough to scare the wits out of you, the hot dogs they fried with that energy was a good lesson. Leave those power cables alone. Another favorite moment was when Darth Vader once again visited the library. I mean. C’mon. How cool is it that Darth Vader has been in the library twice this year so far? The young adults were treated to a chance to sit down with a gentleman who portrays Darth Vader for local functions and at conventions around the area. He talked about making his own custom costume and what it takes to immerse oneself in the role. Plus, for those who stuck around they got to make light sabers. In this moment of reflection, I want to take a moment and thank our Friends of the Library. They provided gift certificates and prizes for our summer reading programs and it was much appreciated. My favorite part was calling people to let them know they had won something. The Friends of the Library do a lot for the library and they make programs like Summer Reading even more exciting. Last but not least, I want to thank you the library patron and community member. Part of what makes a successfully summer reading program is people taking the time out of a busy summer to attend programs at the library. Just as important is people in the community realizing we have such a program and sending their summer visitors over to participate. We have quite a few kids from out of town whose grandparents brought them down to the library during June. Once again thanks. We take a bit of a rest in July, but not by much. We will return to our regular storytimes and will also be offering programs and don’t forget our Friday Movies at 2pm the rest of the summer. As we find the Library coming into the last turn of Summer Reading, we find the activities at the library hitting full speed. We have been amazed by the number of people who have shown up at activities and programs. There have been a few mishaps along the way, but we have persevered with smiles intact. There are two more weeks left of summer reading and if you haven’t had a chance to participate in some way now is your chance. Rattlesnake Andy, Tuesday at 2pm.—Cobra has nothing on Rattlesnake Andy! Come and see some snakes. (We promise there won’t be any live rattlesnakes.) Open to children of all ages. Hometown Heroes, Tuesday at 6pm.—Cops and Robbers with the Kansas Highway Patrol. Come by the library and meet a hometown hero and here all about the job of a highway patrolman. Strong and Strength, Wednesday at 2pm. –Superheroes can stretch, bend, and have huge muscles. Test your agility and strength by joining us for an afternoon workout. Open to children 8 and older. Super Why, Friday at 1:30pm.—Super Why is stopping by the library. Join Wyatt, Red, and the Princess for fun. Stick around for the movie at 2pm. Movie Day, Friday at 2:00pm.—We can’t tell you what the movie will be, but we can say that there will be popcorn and that the movie will feature a theme related to heroes. YA Super Tournament! Monday from 4pm-5:30pm: Mecha, Anime, Battle of Heroes, Stone Cold Crafts, and Games, Games, Games! YA Hawkeye Day! Thursday from 2pm-3:30pm: Hawkeye is awesome: Discuss. Archery practice, make your own bow and arrow. Manga fresh from Japan. YA All Ages-Game Time! 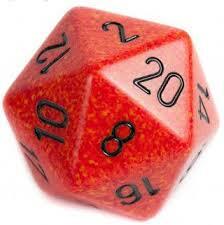 Saturday starting at 11am: Board games for all ages, D20 role playing game demonstration. There will plenty of RPGs for you to choose from. Also featuring Nintendo Streetpass. Nonfiction Bookclub, Tuesday at 6:30pm: We will wrap up our discussion of “Into thin Air” and hand out copies of the next book club book. See you there. This is a perfect time to join the club. Healthy Fun Night, Thursday at 6pm: Amy Thompson from the Kansas State Extension office will be here at the library to talk about Nutrition. A perfect opportunity to be part of a small group discussion and ask questions. Prize Day, Friday at Noon: Each Friday we will draw for our weekly prizes. Get those reading slips in! Summer Reading at the Library is in full swing. Our first week is in the books and we are now moving on to our second week. Thanks to all who signed up and attended events the first week. Last Monday we had Boot Camp with the National Guard, Medusa’s Funky Hair, and multiple programs for Young Adults in the Learning Center. For Adults we had Recipe Swap (my new favorite program), Nonfiction Book Club, and Trivia Night. The parking lot will be host to all kinds of different trucks and work vehicles. Rough, tough, and heavy duty. Get up close and personal with the vehicles! Have all of your questions asked by the people who drive them. Hometown Heroes, Tuesday at 6pm.–Seward County EMS is going to be on the scene. Come check out these Hometown Heroes and learn more about the work they do in our community. Smoky Hills TV, Wednesday at 2pm. –Smoky Hills TV is coming back to the Liberal Memorial Library. 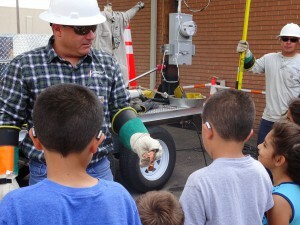 This program is aimed at children 8 and under. 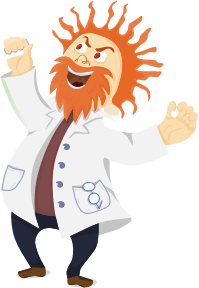 Mad Science, Thursday at 4pm. –Mad Science is showing off superhero science at the library. You’ll see if superheroes really can fly and maybe see a few super powers demonstrated. Free and Fun for Children of all ages. YA Fanfic and War, Monday from 4pm-5:30pm: Feature such topics as Shojo Anime, Halo, Fanfic: the good, the bad, the ugly; and the Watchful Owl. YA We All Wear Masks, and Thursday from 2pm-3:30pm: Features Fanfic Redux, Is the hero the man or the mask? What is your mask? And Manga fresh from Japan. YA Ask Darth Vader, Saturday starting at 11am: Meet the men behind comicon’s Stormtrooper and Darth Vader! Ask about how they made their awesome costumes, the 501st Legion and More! For Adults we will have Adult Crafts on Monday at 6pm, Library and Lunch on Tuesday at Noon, and Healthy Fun Night with Kay Burtzloff on Thursday at 6pm. In addition to these special events we also have events every day for children. And I hope that the adults in our community do not feel left out. For them we have Adult Summer Reading. You can participate in the June program, or just stop by to fill out drawing slips with a book you have read. We will draw for prizes each Friday. Currently prizes include a $25 Amazon Gift Card, Summer Reading Shirt, and more. It is not too late to stop into the library and take advantage of these awesome programs and opportunities. All programs are free and a lot of them also offer snacks. Summer is upon us. The kids are getting antsy. The pools are getting ready. Plans are being made. Nowhere is the buzz of summer more apparent than here at the library. As most of you know the library hosts a summer reading program for the kids and young adults. Thanks to the work of our Childrens Librarian Casandra and our Assistant Director Tammy, the young people who participate in this year’s program are sure to have an exciting time. Given that the overall theme this year is “Superheroes” you are correct to assume that we will focus on the superheroes found in comics and movies, but we will also focus on the local heroes in our own community who contribute to our safety and well-being on a daily basis. I can hear some of you saying already: “Whoa. Hold up. What about us adults?” Well. Don’t you worry. The library will also be hosting an Adult Summer Reading Program. The theme for this year is built on the theme of “Escape the Ordinary.” We will have plenty of activities for adults. The Adult Summer Reading Kickoff starts on June 1st at 5:30pm. We will sign people up at this event, but you can also sign up right now by going to www.lmlibrary.org/adults/summerreading or stopping by the library. We have all the information about prizes and how the reading program works this year online and when you stop into the library. At the Adult Kickoff we will have snacks and refreshments and the chance to attend the first program of the Adult Summer Reading Program: “Recipe Swap”. Recipe Swap is a great program and one I hope you will stick around to learn more about on June 1st at 6:30pm immediately following the Kickoff. Basically we swap recipes and sometimes someone even brings a dish in. Each month is based on a theme. Give me a call if you want to know more about this program ahead of time. Another new program we will be offering during this year’s Adult Summer Reading Program is our “Nonfiction Book Club”. This book club will meet once a month and the focus will be on reading nonfiction titles. The first meeting will be on June 2nd at 6:30pm. Our first book is “Into Thin Air” by Jon Krakauer. This tells the story of the 1996 Mount Everest disaster. There is plenty in the story to get us talking. Stop by that first meeting and pick up a copy of the book. We will meet back together on June 23rd at 6:30pm to talk about the book and watch some clips from the film. I am excited to get a book club like this started. Please stop by and join in the fun. We will set the future dates, books, and time of the regular meetings at the June 23rd meeting. This year we will be issuing our Adult Summer Readers a library passport. This passport features a variety of ways to get credit for reading and new this year will be the ability to get your library passport stamped by attending library events. I did. Each week we will have a prize drawing. Come into the library before noon on Friday each week during summer reading and fill out a drawing slip for all the books you have read that week. We will draw for a weekly prize that includes: Summer Reading T-shirts, Chamber of Commerce Chamber Bucks, and other related library prizes. We have some cool prizes, but if you are a local business owner or manager and would like to donate some prizes to the Adult Summer Reading program that is always welcome. At the end of the Adult Summer Reading Program on July 2nd we will have our grand prize drawing. Turn in your library passport to the library by July 2nd and we will enter you into that grand prize drawing. The Friends of the Library has donated a $100 Amazon gift card for our grand prize drawing. You do not have to complete the passport to enter the drawing. Summer is a busy time. For some of us, it is the same schedule as the rest of the year. For some of us, it is even busier than normal. Our goal is to get you thinking about the library and what it has to offer you throughout the year. If you would like the library to come out to your business to get your employees involved in the program give me a call. If you have a local group that would like to hear more about summer reading at the library, please let me know. Your local library is an amazing place. I hope to see you here soon. On your mark. Get Set. Read! Next week is National Library Week and the Library has a few things planned. The big event is our Annual Friends Book Sale. Things kick off on Monday when we will host a Friends Reception for Library Board members and Friends of the Library from 6pm-8pm. This will be your first opportunity to buy books at the book sale. Friends of the Library applications will be available at the door for the low price of $5.00. Beginning the following day on Tuesday and continuing on Wednesday we will be open to everyone from 9am to 8pm. All items are moderately priced. Thursday, the last day of the book sale will be dollar bag day. Stuff all you want into a plastic bag, or your own bag, for $1.00. The Friends of the Library is a group that has a long history with the library, but a few years ago withered away. We are currently in the process of getting it to grow again. We are looking for people who would like to volunteer to help the library at library events, summer reading, and during the hours the library is open. Volunteers bring a special energy to the library and our something we cherish very much. If you have any questions please go to the link on our website at: www.lmlibrary.org/friends or follow the Friends of the Liberal Memorial Library on Facebook. The money made from the book sale will go to support other library activities. Most notably our program entitled “A Baby’s Bookshelf.” The way that this program works is that we distribute flyers to all new parents in the Liberal area. When the parent signs up for the program they are able to come to library every two months to pick up a free book for their child. The program runs for the first two years of the child’s life and at the end of the program the child will have 12 books that they can call their own. Early childhood literacy is important to us at the library. Not only do we want every child to start school with a grasp of the essential skills to be effective learners, but we also want them to understand the role the library plays in helping them become better readers. Kids who love reading do well in school, graduate from high school, and become outstanding additions to our community. At 1:00 pm on Tuesday, the library will be hosting a special cake and refreshment celebration to celebrate the Libraries 60th Anniversary as the “Book Front Library”. Back on April 14, 1955 the library opened up its doors with its new look. A look that saw it showcased in newspapers across the country and on tourist postcards for years to come. In fact, we still get visitors who travel to Liberal just to see our unique building. We hope that you can join us. I have challenged myself to make a cake in the shape of the library, so please stop by and see how well I did or didn’t do in this regard. National Library Week is a week to celebrate the library and for me as director to celebrate our most important asset: Our Employees. Our staff represents the diversity of our community and the passion that people in our area have for the library. They take on challenges with gusto and never fail to surprise me with the energy they put into everything they do. Join me in saying thank you to them for their efforts. National Library Week is also a week to celebrate the community to which the library belongs. When I think about what makes our town so awesome I think of things like the Mid-America Air Museum, Dorothy’s House, The Baker Arts Center, the parks, and the Library. I think of the people who visit our library every day. The people wait outside for the doors to open on a Saturday. The kids rushing to our afterschool programs. The participants in our summer reading program. The attendees at our Recipe Swap and Adult Crafts. It takes a town to make a Library and we are proud to serve you. With the New Year comes many new things going on in the library. Starting Tuesday, January 20th the library will start afterschool programming for kids from 4pm-5pm, Monday through Thursday. Activities will include computer programming, video production, audio recording, creating comics and a variety of other crafts and hands-on learning opportunities. These activities will take place in what we are now calling The Learning Center and is accessible via a walkway from the main part of the library. The Learning Center will also be developing computer classes for adults during the day and providing meeting space when not being used for classes or afterschool programming. The library has a long history of community participation through the Friends of the Library group which was fairly active up until about ten years ago. Back in September of 2014 we started making plans to get that group going again and thanks to the help of a couple of local volunteers we will be hosting our first Friends Meeting on Thursday, January 22nd at 6:30pm in the library. This first meeting will be a formative meeting to talk about what the Friends group hopes to achieve, election of officers, and other topics of interest. Consider putting this on your calendar if you would like to become more involved in volunteer activities at the library. Thanks to a grant from the Cooper-Clark Foundation, the library is excited to announce that we are in the beginning stages of installing a digital microfilm station in our genealogy section located in the lower level of the library. The beauty of this machine will be allowing genealogists to search our historical newspapers stored on microfilm with greater efficiency and accuracy. The digital microfilm station will allow users to email documents and to store information on a personal data stick or portable storage. Software included in the microfilm station will also assist users in searching for information without having to read each page in its entirety. We have a librarian on staff who is an expert on these genealogy resources so please stop in and talk to us about getting started with your family tree or family history. The last thing I want to talk about today is not a new service or new device, but the library itself and our service to the community. As we all know, things got pretty cold in town the past few weeks. The library is a great place for those people who want a nice warm place to warm up. We offer some comfy furniture and we also check out laptops and have plenty of Wi-Fi to help you pass the time. We even have a book or two that you can check out. If you have any questions about library services or programs, please stop by the library, check us out online at lmlibrary.org, or give us a call at 620-626-0180.